Dar Williams is a renowned folk musician and composer based in the Hudson Valley who has sold millions of albums and toured across the United States. Williams is also a well-known environmentalist and social justice advocate. "What I Found in a Thousand Towns is a thoughtful and passionately explored journey of how American towns can revitalize and come to life through their art, food, history, mom-and-pop business, and community bridge building. Dar Williams gives us hope and vision for the possibilities of human connection." 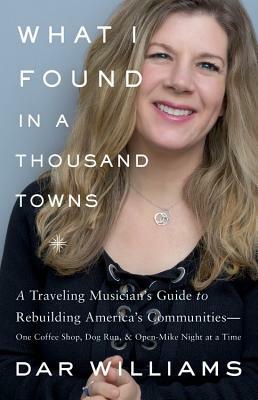 "Dar Williams channels the soul and spirit of Jane Jacobs. With a song-writer's eye for detail and an urbanist's nose for what makes cities and towns work, she provides stunning portraits of America's great small towns. What I Found in a Thousand Towns will open your eyes to the key things that makes communities succeed and thrive even when the deck is stacked against them. I love this book: You will too." "To become a great city planner takes three things: strong powers of observation, the ability to communicate, and the opportunity to travel the world to learn from successes and failures. Anyone who has heard a Dar Williams song is familiar with her gifts in the first two categories. And what better vocation than wandering minstrel to get to know the wide world and all its places? So observant, so articulate, and so prepared, Ms. Williams has created a stealth city planning text that is unsurpassed in its ability to charm and enlighten." "During a time of political, economic, and social upheaval across the United States, Williams' grounded optimism is a refreshing corrective."